In today’s entrepreneurial environment, organisations cannot just settle for incremental improvement. They must periodically endure performance transformations to get, and stay, on top. Mr. Shridhar Venkat - CEO, The Akshaya Patra Foundation is all set to speak about the journey of The Akshaya Patra Foundation and more in the TechSparks2018. 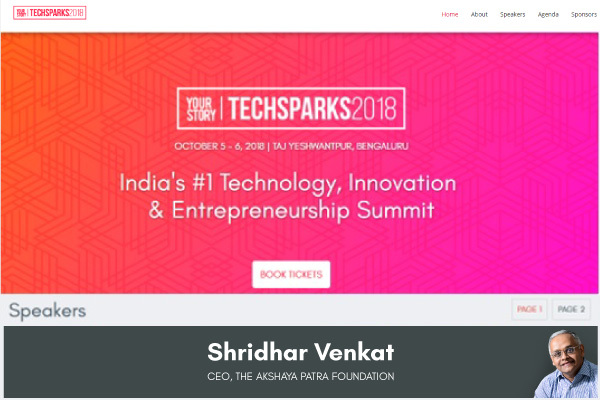 TechSparks is a standard platform where startups, emerging business leaders, corporate executives, policy makers, investors, innovators & media houses come together to discuss, debate and nurture ideas & engagements that build and shape the technology, innovation and entrepreneurship narrative in India.